Kodumudi is one of the important and popular divine spots of South India. It is a sthala of Thrimoorthis (STHALA – Religious and divine place of worship). Guruji Shri Narendra Babu sharmaji spoke on History, speciality and procedure to worship the temple etc.. Let me put everything in points. 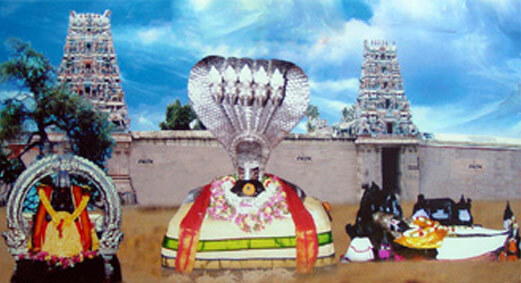 This temple is a Thrimoorthi Temple and so containing the deities of Brahma, Vishnu, Siva The name of Lord Sivaperuman in this temple is Magudeshwarar, the Goddess part is Soundhranayaki. Lord Brahma of this temple has no goddess part. The name of Mahavishnu in this temple is Veeranarayanaperumal with the Goddess part Thirumangai Nachiyar. Lord Sivaperuman of destructive duty, Vishnu of Protective duty and Brahma of creative duty are the trinity of Hindu spirituality system. This sthalam is fullfilled with three main features. A well known divine story of the temple starts with the combat between Aathisesha and Vaayu ( God of lie element 'air'). This war pulses the holy Meru (Divine hill) and makes one Apex into five pieces, after this war the five pieces of the apex changes into five Swayambulinga Sivasthalas. These five sthalas are considered as five types of precious stones and as follows. So the devotees believing this sthala for their brightful future. The Shiva temple at Kodumudi is on the west bank of river cauvery. The east facing temple is 640 feet in length and 484 feet in breadth. The temple houses the shrines for Lord Shiva, Lord vishnu and Lord Brahma. The temple has 3 entrances on the east side. One can reach the shrines for God Vishnu and God Brahma by entering through the central gate. To the north of the central gate lies the entrance for the shrine of god Shiva known here as Kodumudinathar. To the south of the central gate lies the entrance for the shrine of female deity. Another important information about this village is, this is the birth place of Mrs.K.B.Sundarambal. Goddess Malaiyamma or Pechiamman Temple located in Kodumudi is famous Otolaryngology or ENT (ear, nose and throat). Kids with Stammering (Thikku Vai in Tamil ; Tadavarisudu in Kannada) problem or for good education should offer 2 litres Honey Abhisheka to Malaiyamma. After abhishekam to goddess collect back the honey, Kids should have one spoon everyday and parents should have on every Purnima and Amavasya. One should visit Palani Lord Muruga Temple after visiting Kodumudi Temple. Obligations for marriages, child birth, covers a maximum part of prarthana, nexly people those suffering from physical and mental diseases are strongly believing this sthala for their remedy. There are different type of rituals, poojas are conducted by the Thirukovil for the benefit of devotees. Lot of devotees succeeded and attained their goals by the strong hope and prarthana on Lord Magudeshwara. This sthala is famous for Navagraha Shanthi Homam and poojas relating the Navagraha moorthis. Devotees showing their gratitude to the temple by means of offering donations. The Holy and Mystic Vanni Tree without Flourishing and ripening is the Miraculous event of this temple. Vanni tree is a 3000 year old living tree. The last week of Aavani Tamil Month and 1st week of Panguni Tamil Month are the days of Special Dharsan During this periods the sunlight enters through the apeture of the Rajagopuram (Entrance Tower) and reaches the Swayambulingam i.e. the Lord Surya who mingles with Lord Magudeshwara. So this event happens two times, and Lord Magudeshwara blesses the Surya. Kodumudi is the place of cauvery Mother. She turns from South towards East. River Cauvery with this divine personality forms a fulfillment in devotion and makes a satisfaction in the life. So the devotees can approach this sthala to receive the bless and bliss for the fruitful life by means of Thirumoorthi's grace. In India only two temples are dedicated to Lord Brahma, one is in north and other is in south. The temple in North is Pushkar (Rajasthan) and temple in South is Kodumudi (Tamil Nadu). Before having a holy dip in river cauvery, everyone should purchase a doll made out of clay(mud). Don't purchase the dolls made out of plastic. Men should purchase Male doll and Women should purchase Female doll. After having the holy dip one should leave all clothes including innerwears in the river along with the dolls. Sthala Vruksham – Vanni Tree is the three-faced Brahma. The fourth face is considered to be the tree itself. This tree doesn’t bear any fruits or flowers, so the offspring of this very tree isn’t anywhere. Half of the tree has thorns whereas the other half doesn’t. This is to understand that both Brahma and Saraswathi are together here. It is said that this tree is living ever since the times of the Pancha Pandavas. Kodumudi, has a great legend attached to it. It was here the great Saint Agasthiyar sang upon the Magudeshwarar (Shiva) here. Agasthiyar stood on the nearby rock located within the Cauvery River and saw this place. The whole place appeared as a huge Shiva Lingam to him. He decided that, placing his feet on the land would equal to placing his foot on the Lingam, and sang from the rock itself. This rock is still there to be called as the ‘Agasthiar Paarai’. It could be easily reached from Kodumudi temple via ‘Parisil’ – circular boat. Tuticorin Exp (6732) Train is available from Bangalore to Kodumudi. This sthala is situated in the main route of Erode-Trichy, Madurai highways and with source of confluent Train facilities. And so Trains from Erode towards Trichy, Madurai, Kaniyakumari, Thirunelveli, Tuticorin are at the benefit for the devotees. Erode District Headquarters is situated at 38 km from Kodumudi. Karur District Headquarters s situated at 26 km destnations. Both Train and Bus facilities are available to reach Kodumudi.